As part of my 2015 Reading Challenge, I’m delving back into the history of genre fiction, building a little bit more of a sense of where my preferred genres came from and how they’ve evolved. The list is in my last post (um, more than two weeks ago, oops), which is recent enough that I’m not going to recap the whole list (although I’ve potentially added two books to it that I hope won’t overbalance me for the year). Oh, and for some reason, I put the list in reverse chronological order last time. I’m actually going to start at the “beginning” and work up to the “present”. And I’m not promising to not read other things along the way. Either way, I thought I might share reviews and perceptions of the books here, bring you along on my journey, or at least some highlights of it, at least if you’re interested in following. 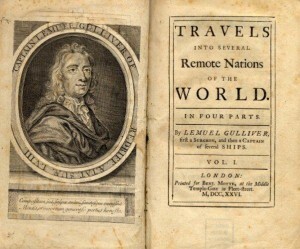 The first book on the list is Gulliver’s Travels by Jonathan Swift, originally published in 1726. It’s hard to classify this one as Science Fiction or Fantasy. It reads more like the second from a modern viewpoint, but one thing that SF has long done, sometimes well and sometimes not, is to point out flaws in our own society and culture by placing them in the context of an alien encounter/society and inflating them to show us how ridiculous or horrible something is. In that tradition, Gulliver’s Travels certainly qualifies as SF. And, along with the burn of satire, that’s the light I try to look at the whole book in. Disturbing to me right away, there’s a “synopsis” on the front of each chapter, which I learned quickly to ignore to avoid spoiling the chapter with a short hand of the events that are about to happen. Here’s where I’m most likely to get hate mail. By modern standards, the writing is weak. Lots of telling, not much showing. Lots of dry description and lots things the narrator mentions in passing before telling us it was something he was told later because he was asleep or unconscious at the time. And I’m not sure how early we are in the grand SF tradition of making things seem strange and alien by giving them strange and alien names, like calling a dog a squornt or some other just pronounceable word. In this case, we are taught that a knighthood is actually called a nardac on Lilliput, and it’s the first of many invented terms used throughout the book. Finally, at least in this first part, there’s no real conversation anywhere in the story, just the narrator relating what was discussed. Mr. Swift lampoons everything from the nobility and class system of the time to war to religion to the English education system to the beliefs and behaviour of people in general. And all of this while we’re still on Lilliput. Sadly, most of what Mr. Swift targets is still recognizable in modern behaviours, if sometimes in altered source or location. In this first part of the book, there’s a lot more easily recognizable as poking fun at English society than some of what comes later. This is also probably the part of the book that most of us are more familiar with as it’s the most frequently covered part of the story in all of the various film and television adaptations. The classic comic books go farther, but I’m getting side tracked. After a brief interlude where the narrator goes home, we’re off to Brobdingnag, the land of giants where the narrator is the size of a Lilliputian by comparison. The satire here seems to almost entirely target the English upper class of the time. With the exception of the child assigned to take care of him, the Brobdingnagians are uniformly patronizing jerks, slightly-evil jerks, or just plain jerks. There’s also a lot more time spent in description in this part of the book, with a great deal of wordage designed to impress upon us just how big everything was, a lot more than time spent on Lilliput on how small things were. There’s also a variety of adventures that, on the surface of things, seem to be purely designed to draw attention to the size differential. I did wonder if this somehow represented Mr. Swift’s view of how the “lesser” members of his society at the time managed to get into trouble “through no fault of their own” from the point of view of their “betters”, but I’m at a slight loss as to why this would be a satirical point he felt the need to make so strongly or so many times. The narrator’s troubles are consistently a source of entertainment and laughter for the giants. We also get a thankfully brief description of the functioning of the English social system and government, followed by the Borbdingagian king asking a (large) number of pointed questions about how the nobility were made fit to rule, how the system avoided the obvious flaws, and how so many particular problems might be addressed. And when king delivers what amounts to a scathing one star review of English society and culture, he does so with crazy long sentences inside the first set of quotation marks I remember in the book. In part 3, where I spent the most time trying to wrap my head around what Mr. Swift was trying to accomplish with the story, after being set adrift by pirates (at this point I’m starting to have a harder time with Gulliver’s tremendously bad luck as a sailor: a ship wreck, an accidental abandonment, pirates, and a mutiny still to come), we start with the flying island of Laputa. The Laputans remind me of the old story about the farmer’s donkey. You know the one: first you have to get its attention. Swift, however, was targeting academics rather than donkeys. Actually, a big part of the third part of the book takes aim at the world of 18th century Academia. The Laputans are forever arguing, providing “informed” opinions on things outside their expertise, and calculating completely useless things while ignoring the practical needs of everyday life. (This is also where we have presented to us that Gulliver—Swift?—shares in the predominate sexism of the day with regards to his treatment of female attitudes and actions in Laputan society.) I rather enjoyed the magnetic anti-gravity, though, and his prediction that Mars has two moons about 150 years before their actual discovery. On Balnibarbi, part of the dominion of Laputa, but a more traditionally earthbound land, we find a nation of crackpot schemes without practical use and never seeing completion, but draining tremendous resources in the process. (Anyone want to commission a new study on the flow rates of ketchup?) And then there’s all of the “speculative learning” in half of the great Academy. We do switch over to political science for the last chapter here, learning what Mr. Swift seems to think of the English parliamentary system by the ridiculous suggestions the speculative learners in this branch of knowledge come up with for better systems. The answer boils down to not much. Glubbdubdrib is harder to understand as satire. The king her makes servants of the dead, whomever he wishes, for a day at a time and no more than once every three months for each. The dead will answer questions, but only about their own lives and times, and cannot lie. Gulliver gets to summon up all manner of historical figures, and while it’s clear which the author likes and doesn’t like, he seems mostly to be engaging in a game of “what if”. This is cool, and even interesting, but seems out of place when looking at the rest of the story. Mr. Swift does manage to point out how frequently royal lineages are “interrupted” by what we might politely call “non-paternity events” and to express his general disappointment with more modern history (his modern rather than ours), with events run mostly by cowards, weasels, and liars, but how the seeds of this stretched back even to Rome and ground on until the England of “today” is a sallow, diseased, and pathetic nation. One might get the impression that Mr. Swift didn’t like people, individually or collectively, all that much, but I’m not seeing the satire in these two chapters. Next stop, Luggnagg, land of yet more ridiculous customs. We’re getting close to Swift’s present here, with a quoted date of 21 April 1708 as Gulliver sails into the harbour before spending a couple of weeks confined by customs. From there to court to see the king. (You might recall we recently learned that kings are really only distinguished from commoners by being bigger jerks than the rest of us, but Gulliver doesn’t see fit to mention that again.) It’s hard, at this point, to miss that every court he presents himself at has more bizarre customs than the last, a slow driving nail at royal pomp and ceremony. But a bigger deal on Luggnagg is that some small fraction of the population is born naturally immortal. Not immortal in an everlasting youth kind of way, but more in a normal life until you get old and then stay old forever kind of way. Much less appetizing, especially when you throw in constantly deteriorating memory and mental faculties. These immortals are considered a burden on society and live wretched existences filled with unhappiness, ill health, and contempt. There are laws to make sure it remains that way so that a handful of ancient mental incompetents don’t ruin the entire Luggnaggian society. I’m not sure if this is commentary on how English society treated its elderly at the time or the folly of wanting to live forever. It works either way, if you look at the aging process to continue on as long as you’re alive. Japan isn’t much more than a stop off point on the way home, though Gulliver does manage to visit the Emperor and get around the “requirement” of Dutch traders having to “trample upon the crucifix”. This is a little obscure to me, but the idea of fumi-e was to root out Christians and sympathizers as Christianity was outlawed in Japan from the early 1600s until the 1850s (no official executions past 1805, apparently). The little bit of reading I’ve done suggests this was to find Japanese Christians, but clearly Mr. Swift wasn’t keen on the idea as he had Gulliver avoid it. But I’m getting side tracked again. Staying happy at home doesn’t last for long, and being master of his own ship a shorter time than that. After a mutiny and imprisonment in his cabin, Gulliver is put ashore in the land of the Houyhnhnms. And here we get an almost completely different kind of story. The Houyhnhnms are horse people. Literally. The people in this strange land are sapient horses. The humans, on the other hand, are barely more than monkeys, somewhere between draft animal and pet, although there are plenty of wild ones in the forests. Most of this part reads like a rather dry “I woke up among aliens and had to learn to survive” story. Whether it’s the first of its kind or not, I’m not well read enough to say, but it has all the marks: learning an alien language (though Gulliver has done this several times), adapting to the available food, utilities, and resources, and culture and worldview of one’s strange hosts. Again, Gulliver has done this several times before now, but never before with beings who are so clearly nonhuman. It’s hard to see where the satire begins here, where we transition from the narrator trying to explain who he is and where he comes from to a list of all of the worst traits and habits of humanity as a species. To a large degree, this part of the book is far more about pointing out all of the things Mr. Swift doesn’t like about his fellow human beings and European society. There’s little to the structure beyond the narrator having to take great pains to explain all of the evils in the world to an alien who doesn’t understand humans in the first place and whose language doesn’t have the concepts to cover most of the issues being discussed. Sometimes the Horse Lord takes it in turn to point out similar things about the Yahoos (native, non-sapient humans, and Swift seems to have coined this word, adopted into English as an insult), without real understanding. The horses (Houyhnhnms), of course, are briefly demonstrated to be what humans should aspire to. But the list of problems with people is a long one that just continues to grow until Gulliver leaves for home once again. Where he stays, finally, though not without a quick (and forceful, and insightful) tirade against colonialism and a long note about how he’s slowly adapting to his return to living among the crazy and evil humans. Looking back over my review, I’ve spent a lot more time on the back half of the book. I’m not sure if that’s because I had less (actually no) familiarity with this part of the story going in, or if I had a harder time swallowing the vitriol Mr. Swift wrote with. But you might guess the book doesn’t work as a whole for me. Part 1 (Lilliput) is brilliant satire, if not terribly well written from my modern-ish POV, but I’ll admit a lot of that may be different expectations in prose and story structure. Part 2 (Brobdingnag) is less brilliant, but more focused, if also more rambling and drawn out. Part 3 (several different bizarre lands) is mostly silly, but some of the ideas presented in the Academia and Political Science are hilarious taken on their own. Part 4 (the Houyhnhnms) mostly falls flat as a living among aliens story, describing humanity by picking out all of the bad points without ever bothering to address, or even mention, any good ones. I find I can look around at our society and discover a lot of the problems Mr. Swift raised in Gulliver’s Travels. Yes, some of it has shifted around a little, but we can still find vice, disparity, selfishness, and contempt, not to mention flat out ridiculous practices in our politics, our government, and the various things that make up the support structures of our society and lives of our citizens. Has our treatment of society’s weakest members really improved? How about the way we choose our leaders? The way we look at the world around us? The way we treat others in general? The ivory tower academics certainly still exist, as do politicians and public figures worth only our contempt. All of the ills and issues Swift points out or makes fun of are still here in some way, all of them things we continue to struggle against. 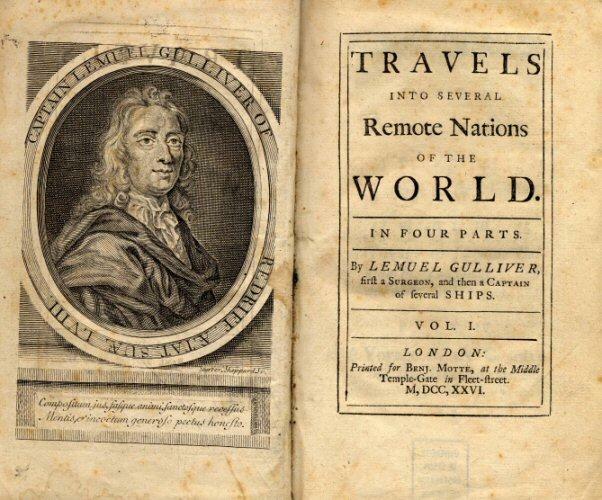 I don’t know how long it took to write Gulliver’s Travels, but since it first began to see publication in 1726 we can call it the best part of 300 years since other eyes than the author’s read it for the first time. In those three centuries, I’d like to think the human race has matured and grown a little. But I’m not always sure I can. Overall rating: 3 Stars. Taking only writing and story, this comes out to a sort of “meh” for me, at best, but it Gulliver’s Travels did make me think about the world around me in the light of “the more things change, the more they stay the same”, and it was a nice starting point for my journey through spec fic history. So, that’s my take on Gulliver’s Travels. Opinions and arguments welcome, even if we don’t agree. Next up in the journey, Mary Shelley’s Frankenstein.